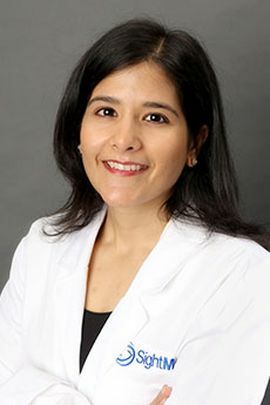 Shetal Shah, MD, is a cornea specialist and comprehensive ophthalmologist at SightMD. Dr. Shahâs interests include the medical and surgical treatment of corneal diseases, cataract surgery and LASIK surgery. Dr. Shah enjoys focusing on patient education and customizing treatment plans that utilize the latest technologies for each of her patients. Dr. Shah grew up in Commack, where she attended Commack High School. She then went on to complete her undergraduate education at New York University, where she received a Bachelorâs of Arts degree in Biochemistry. She further completed her medical doctorate at State University of New York Downstate. She completed her internship at Maimonides Medical Center. Subsequently, she returned to SUNY Downstate to finish her ophthalmology residency. She then completed a Cornea and Refractive Surgery fellowship at University of Texas Southwestern. Dr. Shah considers it a privilege to be able to care for patients in the communities she grew up in. Outside of the office, Dr. Shahâs personal interests include travel, music and reading.